The Blood Trough is fitted in the killing line directly behind the killer. Each blood trough is uniquely designed to fit the killling line layout to ensure that all blood is collected without conamination to the factory floor. 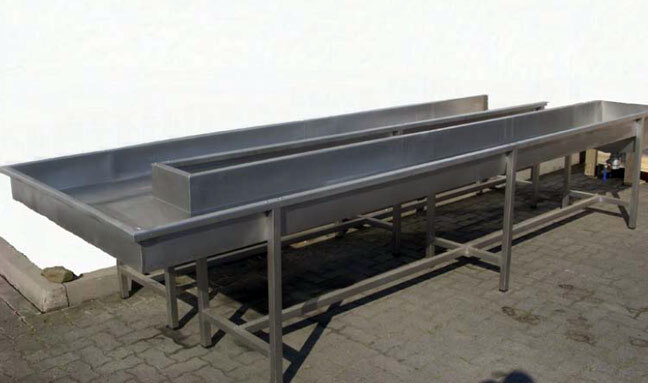 Our blood troughs are made entirely from stainless steel and other non-rusting materials and are equipped with outlet connections to the blood pump and offal system. They also have a second drain for cleaning purposes. The bleed time is determined by individual factory requirements, however, we recommend a minimum bleed time of at least 2 minutes. For Halal factories that do not stun birds prior to slaughter, we recommend the use of a cone killing and bleeding carousel, where live birds are contained securely withing a stainless steel cone which minimises wing and other damage caused by vigourous flapping.